Cars have changed in the last few decades such that they don't rust that fast anymore. They are designed differently so all the rust-prone components and areas don't rust that easily anymore. The use of modern materials has also helped a lot. Still, car ownership may sometimes involve dealing with rust, no matter how ancient or modern your car is. As rust slowly eats away all the metal that surrounds it, it sure isn't a sight for sore eyes. 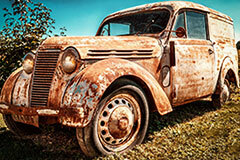 If you plan on selling your car sometime in the future, no one will want to buy a rusted old wreck. Depending on its location, rust can also lead to the development of several mechanical problems with your car and jeopardize your safety and the safety of other drivers. Luckily enough, it isn't that hard to prevent it, and protecting your car is just a few easy steps away. The first and probably most important part of protecting your car from rust is to wash it on a regular basis. All the debris and dirt from the roads end up on your car and they may damage your car. If you didn't know, salt is one of the main causes of rust. So if you live by the sea, your car is at a much greater risk of rusting away. This is also true of road salt, which your car is bound to encounter a lot if you live in an area with extended periods of subzero temperature. To protect your car from rust, you simply need to wash it at least once every other week. You can take it to a car wash or do it yourself. You just need a bucket, garden hose, detergent, car wax, microfiber towels, and water. You'd have to hose the car's undercarriage to get rid of road salt. It's important to clean your car's drain plugs as well. Polising the car with wax once a month is highly recommended as well. If you really care about your car, you won't just wash it on a regular basis. You will also treat it with various rust protection products. This is a must if you've chipped paint or bubbles in certain areas of your car. These areas are usually around the fender and windows. Upon inspection, you need to clean the affected area. Once it's clean, make sure that it's dry before applying a coat of anti-rust spray. Doing so will protect your car from rust and prevent further damage. Even though it may not make much sense at first, it is very important to treat your car interior properly in order to protect it from rust. If any surface of your car interior becomes wet, especially during the winter, you need to wipe it down. Wet surfaces in your car interior can lead to oxidization. That's one of the main causes of rust on a car's body. This is a simple process and you just need a clean microfiber towel or cloth. Another step forward would be to use lacquer, lubricant, or wax to treat the car interior, because products like these are meant to prevent water from reaching the car body. If there are early signs of rust on your car, you need to treat it right away, as it can spread very rapidly. A simple rust removal kit will help you get rid of rust from the affected area. Once that's done, sand down the rusted area with different grades of sandpaper. Next step is to treat the affected area with primer. Make sure it's completely dry before moving on. If the area is close to glass or trim, mask them with tape. The final step involves re-painting the area. Once it's dry, you need to apply another clear coat as well. Even though rust may cause cosmetic and mechanical damage, it isn't that much of a problem to deal with it. You just need to treat it very early. The methods shown here will keep rust at bay for years to come.